Over the holiday break, The New School campus grew to include two new student facilities designed to enrich available study resources, increase space for student activities, and consolidate disability and health services at a single address in the center of campus. 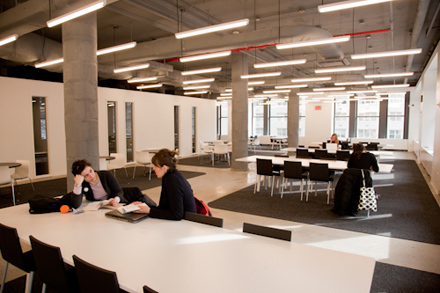 As the spring semester begins, new facilities at 80 Fifth Avenue and 90 Fifth Avenue have been furnished and staffed and are open for business. The new Student Study Center can maximize time between classes. 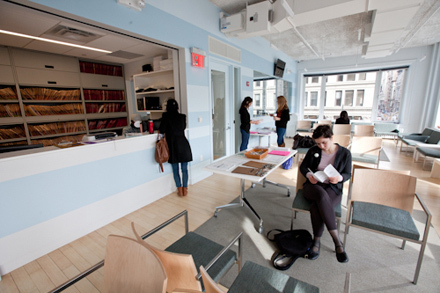 At 90 Fifth Avenue, a new Student Study Center adds nearly 9,000 square feet of new space. The two-level facility on the northwest corner of 14th Street provides several group study rooms, open lounge seating, a laptop bar, and email kiosks. It has full wireless access. The facility even includes a small pantry with microwaves and a refrigerator for dining on the run., The space, which housed a bank branch for several years, was renovated by Lyn Rice Architects to maximize the natural light that enters the space from 14th Street. The Study Center’s hours of operation will expand throughout the semester much like campus computer labs, culminating in 24-hour access during finals week. The Study Center will also house the offices of Student Development and Activities, Intercultural Support, and the Higher Education Opportunity Program. Student health and disability services are now under one roof. Directly across 14th Street at 80 Fifth Avenue, a new Office of Student Health and Disability Services also opened in January. Designed by Ohlhausen DuBois Architects, this third-floor facility consolidates offices that were scattered throughout campus and places them under one roof. The offices at 80 Fifth Avenue include medical services, counseling, health insurance, and student disability services. In addition to private consulting rooms, the space was designed to house health education programming, with conference rooms and open areas that can be converted for public information and education sessions. Both of these Fifth Avenue addresses were planned with stakeholder input. Throughout the design process, students and faculty contributed details about their specific needs and worked with the University Facilities Committee to create spaces that will enhance student experiences and extend the boundaries of the university community.